15-Jul-2008 -- This is the sixth out of 23 confluences that I visited on my bicycle trip to the North-East of China. The story starts from 40°N 117°E. The previous day, I had visited 42°N 120°E and spent a short night in Nàimànqí (奈曼旗). Nàimànqí is a small town surrounded by huge areas of sand and is located 40 km north-west of this confluence point. I got up at 3:50 am and started cycling at 4:30 am. Due to my intention to visit this confluence, I had to take some minor roads to a place called Gùrìbānhuā (固日班花). This – to my mind – bleak town is located 3 km beeline distance to the confluence point. Such a distance doesn’t sound a lot, but the tracks I took turned out to be extremely sandy. Some light rain helped to make the sand sticky. As a result, my bicycle-chain and the gears got bad harm. However, I rode/pushed the bike in the right direction and approached this way the confluence. At a distance of 800 m I underbridged the motorway Chifeng – Tōngliáo. If you visit the confluence by car, you might consider to simply stop directly at the highway. I think the shortest distance will be less than 400 m.
A sandy track directly lead to the confluence point. According to my measurements, the point was 2 m into a corn field. With 4 m accuracy, it could be located directly at the path. I took the same route back to Gùrìbānhuā and continued my tour towards Tōngliáo (通辽). For quite a while, the road was in an extremely bad condition, comparable to the sandy tracks that I took before. The light rain gradually turned into pouring rain. I let you imagine in which state me and the bike had gotten. Finally, I reached the main road. From there, it was another 125 km to the next place with a hotel: the city of Tōngliáo. Imagine that the pouring rain stopped exactly at this moment when I entered the city. Time starting the deviation: 5:00 a.m.
Time at the CP: 7:05 a.m. 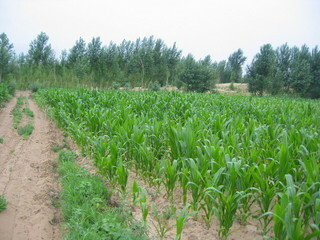 Description of the CP: In the south-eastern part of Inner Mongolia in a sandy, sparsely populated area. Close to the motorway between Tōngliáo and Chifeng. Story continues at 44°N 122°E.